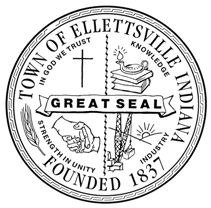 Ellettsville was founded in 1837 and officially incorporated September 16, 1866. Today, the town government consists of the Town Council, Clerk-Treasurer as well as Street, Utilities, Planning, Police, and Fire Departments. The five-member Town Council and Clerk-Treasurer oversee the administrative and financial functions of the town government. Ellettsville officials strive to work closely with other elected officials and area organizations that have a stake in the well being of the community, including the Ellettsville Chamber of Commerce, Ellettsville Main Street, Monroe County Government, Monroe County Solid Waste District, City of Bloomington, Bloomington Economic Development Corporation and The Town of Stinesville. 1150 W. Guy McCown Dr.